My parents, my kids, and myself spent a few days at the beach, lounging in the sun, eating crabs (I love seafood! ), and swimming. It was wonderful! But now, I'm on day 19/21 of my short summer break - and I'm sad to go back to work on Wednesday:-( But, all good things must come to an end! Looking forward at the calendar, I'm trying to plan out my professional development for this next school year. I have applied to present (for the third year in a row) at Powering Up With Technology (I'm awaiting to hear back if I have been selected), and I need to find a way to show my iPad on my computer (I have a new MacBook Air for the first time to use for presenting). About 2 years ago, my school started using Reflector to mirror the iPad to our computers, and we've never looked back. 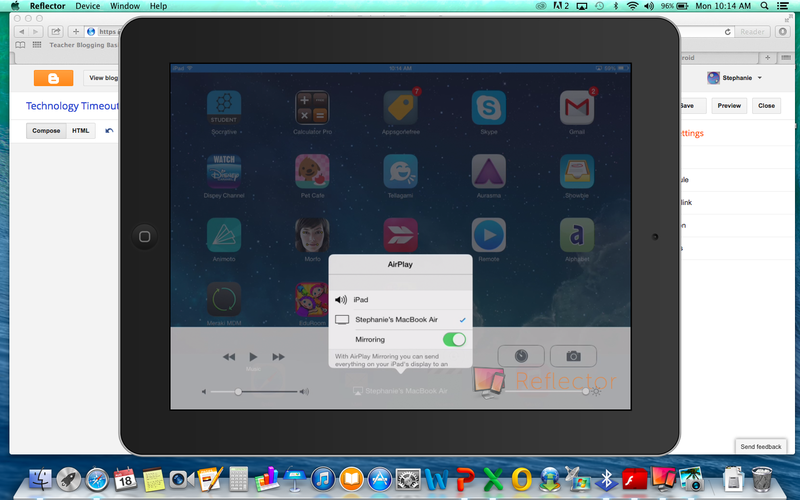 Reflector is a software program that you download to your computer (not to the iPad), and it runs in the background. In order to use it, open the program (you won't physically see anything there, but it is working), then grab your iPad. 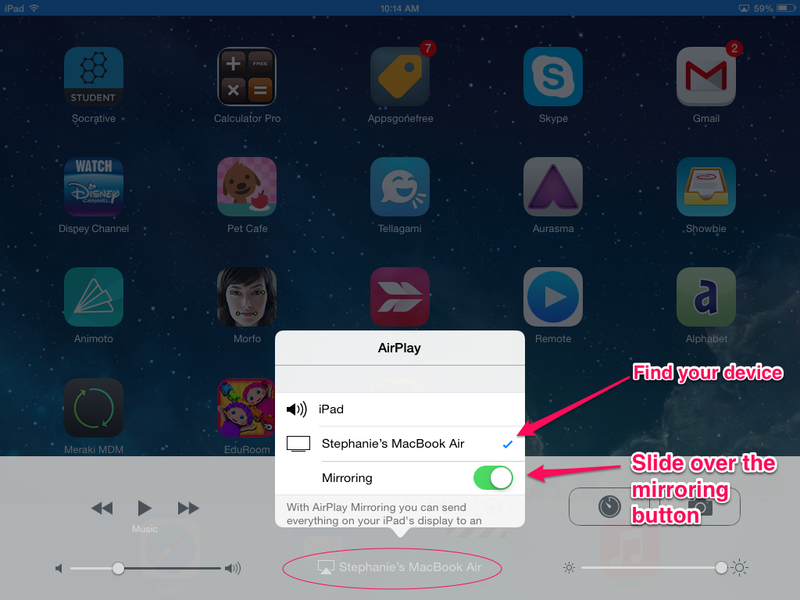 Slide up the bottom bar of the iPad to find your AirPlay button. When you find your device, touch it. Then, slide over the Mirroring button. Magically, your iPad screen will appear on your computer! Not only is this a terrific way to present using apps to adults, but it would be great to introduce how to use an app to your students. Everything you do on the iPad, will happen in real time on the computer (that is attached to a projector). I have also used it in the classroom with my students. When working out a math problem on the iPad using ShowMe, I asked students to open their AirPlay and display their work on the projector. I've had up to 8 iPads on the screen simultaneously! Reflector was originally designed only for Apple products, but they have recently added PC and Android capabilities. Right now, you can download it for $10.39, or you can have a 7 day free trial. Have you ever used Reflector? You're right - Reflector is terrific! I use it for my professional development classes with my Mac and in the classroom on the PC. It works great whether I'm teaching teachers or students. It's a great way for students to share their work with the rest of the class, or for me to demonstrate how an app works. Thanks for the post!